As I'm sure you well know, we are avid fans of travelling on a budget. With only £25 between us per day, we usually opt for the cheapest accommodation possible, eat with the locals, and pick and choose our activities carefully. We started doing this out of necessity, we had saved up enough money for 10 months and needed to stick to the budget carefully or risk going home early! But after a few months of doing this, we decided that it was our preferred way to travel. You meet so many more people when you are trying to save money, whether that be through hitchhiking or eating in cafes with the local folk. Our host picks us up from the visitor centre in an open-air truck and we bump along the sandy desert floor, marvelling at our first glimpse of Wadi Rum. There are a few other 4X4's speeding around, trying to find the best spot for sundown. We arrive at our camp just before sundown, the shadows are long and the sands are a stunning shade of orange in the low lighting. We had booked the cheapest double possible with a shared bathroom, but on arrival we were told that we had been upgraded for free into one of their luxury tents with a panoramic desert view. It really was our lucky day! No curtains.... just this view for the next 14 hours. We feel as though we've hit the jackpot. I don't know about you but I've never stayed anywhere quite as epic as this. The oversized window makes you feel as though there is nothing between you and nature, that the desert sand almost continues onto your bedroom floor. Before feasting on a Bedouin dinner, we climb up onto the rocks nearby and silently watch the sun go down. What's better than nature, the sunsetting, and our friends to share it all with. The sun comes up and we are keen to make the most of our time in this incredible place. We head out for a walk to the mountains ahead, and on our return spend the next 15 minutes meditating in front of this stunning view. No one's around, it's just us and the landscape. The central focus in the camp is the fire, and everything else works around it. There is always 3 pots of tea brewing on the flame; lightly sweetened mint tea, sweetened mint tea, and crazily sweetened mint tea. I opt for the least sweet option, thinking that it's going to be bearable, but it's so disgustingly sweet that my teeth are furry after only a few sips.... I think I'll pass and avoid any future decay! Mark's enjoying the comfort of the open-air camp after 9 months worth of slumming it! Goodbye damp dingy rooms, and welcome tribal fun camp. On the other side of the camp behind a huge rock, is more seating for those looking for a quiet spot to read in. In the afternoon this will be flooded with sunshine. 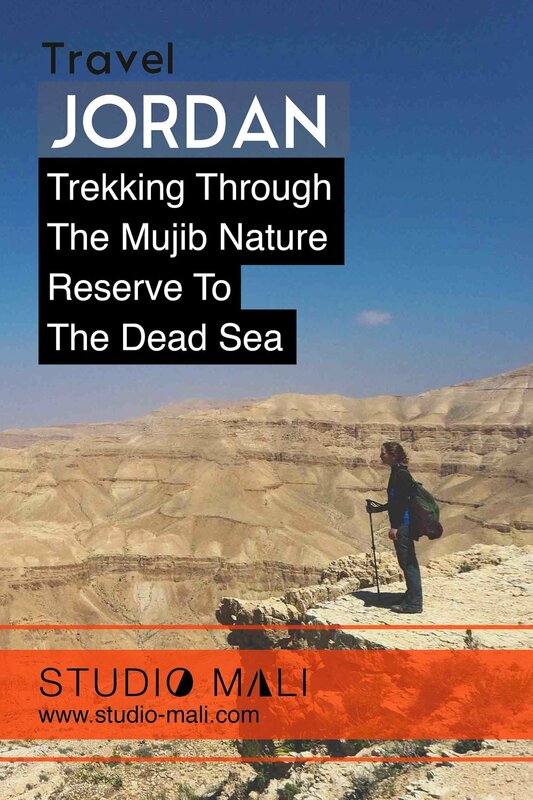 The Bedouin people make up over a third of the population of Jordan, and are known as animal breeders and herders. Some even adopt a nomadic way of life, moving at various times of the year for the benefit of their livestock. It is common to see ethnic textiles like this in hotels and camps around Jordan, and these days it is mostly mass-produced. Traditionally women would have hand-woven textiles in designs similar to this, and they would have been used to make shelter for their families. Bedouin camps used to be called 'Beit Al-Sha’ar' which means 'house of hair', for the fact that it was all woven from goats hair. For those of you that don't know, zataar is a delicious spice mix popular in Jordan and the middle east. The locals love to eat it on everything, and after visiting Jordan we shared the same love for it. For our breakfast we got to eat it with eggs, flatbreads and cheese, lucky us! We book in for a quick tour of the surrounding area, and try to squeeze in as much as possible before getting back to Amman. 2 hours in the 4X4 sets us back 35JD (£35) between the 4 of us and we get taken to some sand dunes, a viewpoint, to see some ancient rock inscriptions and a carving of Lawrence Of Arabia. It isn't the best tour we've ever been on, but it's pretty fun riding round the desert at high speeds. A trip to the Wadi Rum desert definitely isn't the cheapest thing to do in Jordan, but actually we think it's worth the splash out for spending at least a night there. The scenery is just unworldly, the camps are very relaxing, and it's one of those experiences that will stick in your mind for a long time afterwards. This is where they filmed the 60s classic blockbuster 'Lawrence Of Arabia' and the less classic 'The Martian'. We were half expecting Matt Damon to pop out from behind a rock and shout..... "Matt Damon". If you are trying to visit on a budget then just bear in mind that there are a few hidden costs involved; dinner is around 10JD (£10) per person at the camp, but you can bring your own if you want to. 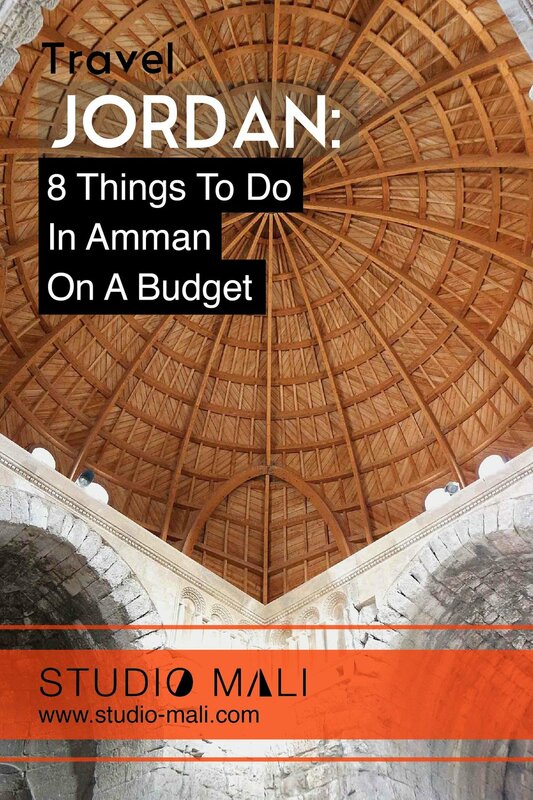 A taxi back to Aqaba costs around 35JD (£35) where you can catch a local bus to Amman. There is no direct bus to Wadi Rum from either Amman or Aqaba, but you may be able to jump out on the main road if your bus is passing. 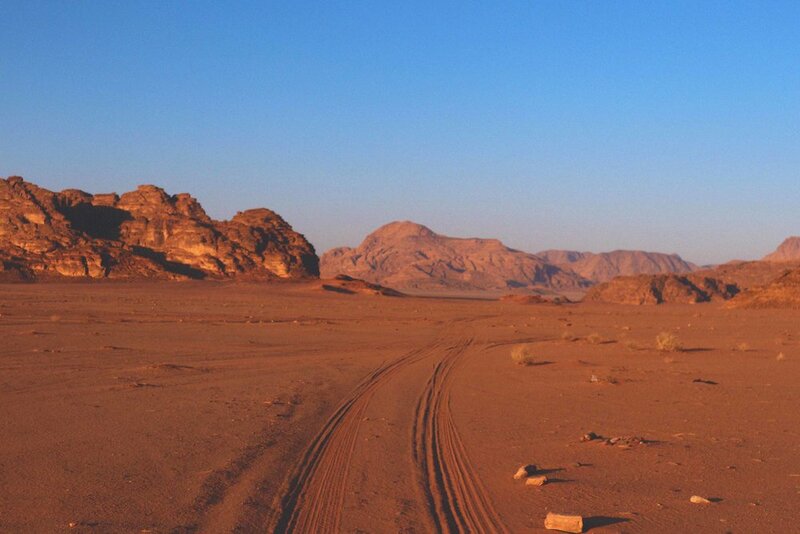 On leaving Wadi Rum, you could potentially get to the Desert Highway and try to hitchhike to Aqaba or Amman from there. Tours cost around 35JD (£35) for a 2 hour ride in a 4X4 and that's to see 4 tourist sights. Breakfast is free at the camp. 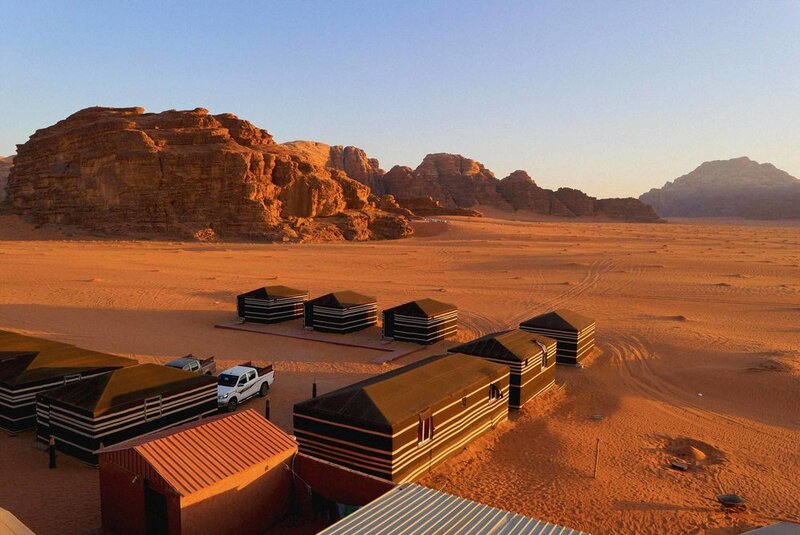 We stayed at one called 'Wadi Rum Dream Camp' but there are many more around that you can find on booking.com. We had a free upgrade to stay in their luxury double room tent with a bathroom, and it cost us only 25JD (£26) for the night. We heard about a couple that booked somewhere to stay online and sadly the camp didn't exist, just make sure there are plenty of reviews and ratings before you book somewhere. If money isn't an issue for you then we would recommend staying for a few nights unless you are one of those people that gets easily bored. There are plenty of walks to do around there for free, 4X4 tours, camel riding and just generally chilling out at the camp. 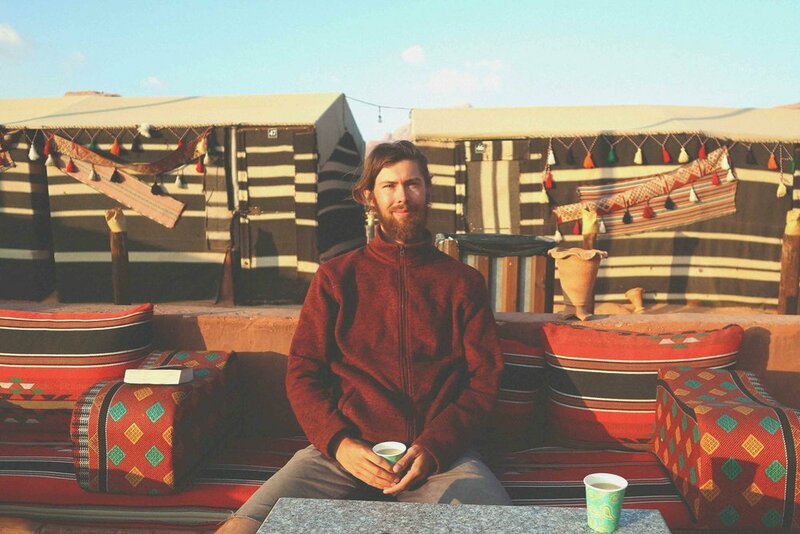 We would love to go back and spend some more time in Wadi Rum. There is something very special about being in the desert and at the mercy of mother nature. All in all, it's a very invigorating experience. If you have any questions then just hit us up in the comment box below! All of the articles on our website are free but if you can support us by viewing, sharing or even purchasing from our travel-inspired shop, you'd make our day! Every share, like or sale gets us closer to our dream.....you guys rock.